Greetings, and L’Shana Tovah! 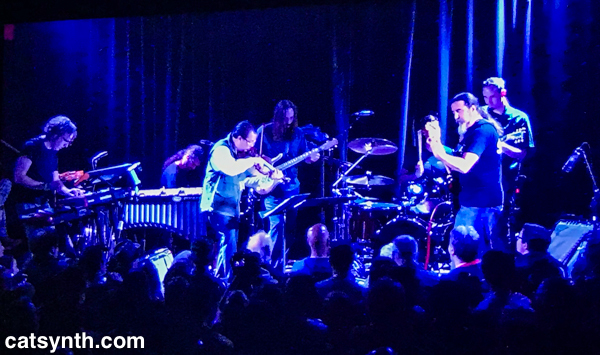 Today we look back to a show from last weekend at The Chapel in San Francisco where two bands interpreted selections from John Zorn’s Masada songbook. It was part of a four-day residency by Zorn at the Chapel in celebration of his 65th Birthday. “Masada” has morphed and grown as a musical concept since Zorn’s original Ornette-Coleman-inspired group from the 1990s. There have been follow-up projects, notably Electric Masada that we at CatSynth are most familiar with. But it is as much a songbook as a collection of ensembles. The “Masada songbook” contains hundreds of short compositions, sometimes just fragments, scales, or concepts. Originally intended to be performed by the ensembles, these compositions can be interpreted by other bands. And on this night, the bands took them in decidedly rock direction. First up was Cleric. 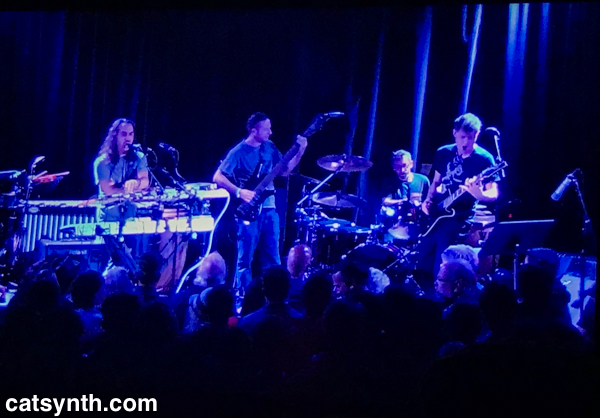 The Philadelphia-based “avant-metal” band currently features Matt Hollenberg on guitar, Nick Shellenberger on keyboards and vocals, Larry Kwartowitz on drums, and Daniel Ephraim Kennedy on bass. As their background implies, the performance was decidedly metal, a full-on triple-forte projection with growling vocals and fast runs punctuated by heavy drones. Nonetheless, it was top-notch musicianship and an adventurous choice of music. Within the mix, I found myself mostly focused on Shellenberger’s vocals and keyboards, though Kennedy’s six-string bass took center stage visually, and Hollenberg’s guitar performance added a solidifying aspect to the music. It was a solid set, and certainly an interpretation of the Masada songbook we have never heard before (and may never hear again). Next up was Secret Chiefs 3, who brought a decidedly different sound and presentation to the stage. Led by guitarist and composer Trey Spruance (formerly of Mr. Bungle and Faith No More) and heavily featuring Eyvind Kang on violin, the group weaved together jazz, rock, folk, klezmer, and Middle Eastern influences into their eclectic set. Rounding out the group on this night were Jason Schimmel on guitar, Matt Lebofsky on keyboards, Shanir Blumenkranz on bass, Ches Smith on percussion, and Kenny Grohowski on drums. It was an inspired and highly dynamic performance from these hometown favorites, and the band seemed a good match for the Masada songbook. There is an explicit thread of mysticism and the esoteric in both Zorn’s music and the work of SC3, so this is not surprising. I even recognized a couple of songs from Electric Masada recordings. The orchestration was brilliant and clever, bringing out each of the musicians as well as the Jewish influences of the songs. There were contrapuntal moments where the musicians played different lines and rhythms but coming together for short emphatic choruses with syncopated lines. It was crisp, tight, but also fun. And one could sense that the audience – a packed crowd on both levels of the Chapel, was having a great time along with them. The set was also the perfect length, keeping up the energy without petering out or overstating their welcome, leading to a single climax note that ended the music and cued Zorn and the musicians from Cleric back to the stage for a final group bow. Overall, a fine night of music. As with many multi-day festivals, I regret not being there for the other nights, but glad I was able to make it to the one that I did. September is always the busiest month for music (and art) in San Francisco, and we will have much more to experience and share in the coming weeks.